The WMEM1024 series of AC/DC wall mount power supplies provides up to 36 watts of output power in a 2.98” x 1.69” x 1.19” package. This series consists of single output models ranging from 5VDC to 48VDC with an input voltage range of 90~264VAC. This series is RoHS and WEEE compliant and meets CEC Level V, VI requirements. This series also has UL/cUL 60601-1 medical approval. These supplies are protected against over voltage and short circuit conditions. Models are available in United States (U suffix), United Kingdom (K suffix), Europe (E suffix), and Australia (A suffix) types. Notes: 1. 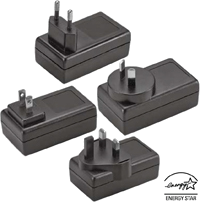 The “x” in the model number represents the type of plug: “x” can be “U” for United States type, “K” for United Kingdom type, “E” for Europe type, or “A” for Australia type. 2. The output voltage is specified as a range (Ex: 36~48 VDC); the customer must specify what they want the voltage set at. 3. Ripple and Noise is measured at nominal line and full load with 20MHz bandwidth and a 0.1µF ceramic capacitor and 47µF aluminum capacitors in parallel across the output. 4. 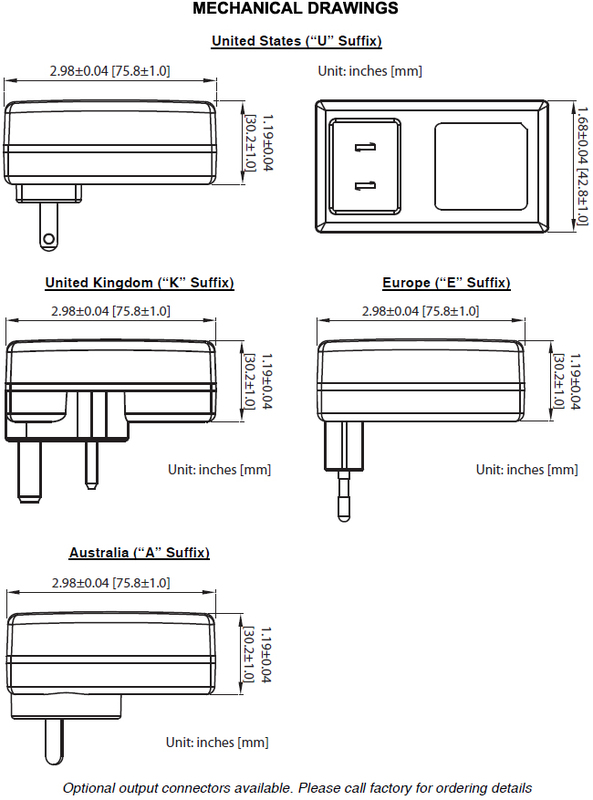 Optional output connectors are available. Please call factory for ordering details.